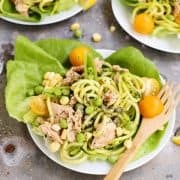 These Lemon Pepper Salmon and Zucchini Noodle Salad Cups are fresh and light and loaded with the flavors of summer! We just had our first 90° day of the year here in Minnesota this past week. With the recent rains adding humidity to the mix, the air was heavy and not exactly lovely. But our family was on our way out the door for our first little getaway of the summer…heading to a much cooler area of the state on the beautiful North Shore. The usual summer crowd had not yet arrived north of Duluth, making it feel like we had the place to ourselves. We hiked the trails and swam (in the indoor pool at Lutsen Resort, not in icy Lake Superior!). And wandered and shopped our way around the quaintness of Grand Marais, enjoying wonderful meals of fresh local trout and whitefish and plenty of nutty Minnesota wild rice. We were active, yet incredibly relaxed. It was a wonderful way to celebrate the first official week of school being out for summer. For a few photos from our weekend, see here, here, here, here, and here. The temps have come down again since our return, but I know those 90-degree days will be back. And for those summer days when the temperatures rise higher than normal, I like to make sure our fridge is stocked with all kinds of good, cool salad fixings. 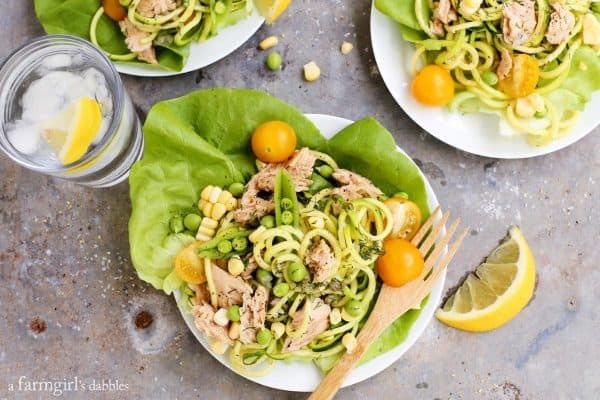 These Lemon Pepper Salmon and Zucchini Noodle Salad Cups promise to deliver tasty fresh goodness all summer long. * This post is sponsored by Chicken of the Sea. Last summer I ate more zucchini than I ever have before. And it was all because of my spiral vegetable slicer that helped me crank out fun noodle shapes. I became quite fond of the texture and flavor that the veggie noodles gave to my salads. Soon I was spiralizing six or so zucchini at the beginning of each week, for curly additions to my salads all week long. 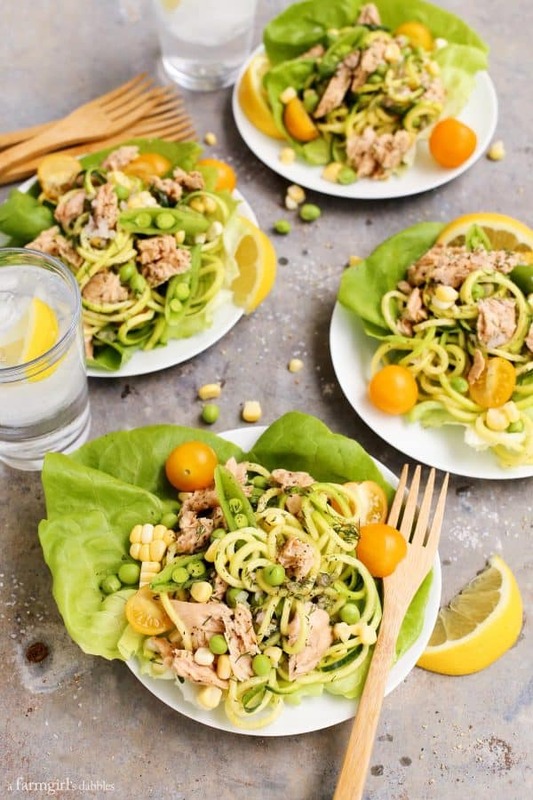 This new salad recipe features a bed of fresh zucchini noodles nestled into cups of butter lettuce leaves. 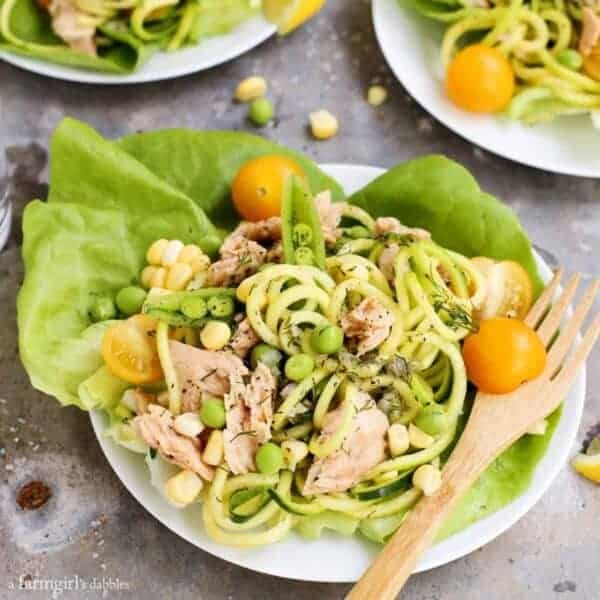 These zucchini noodle cups are incredibly flavorful, thanks to a homemade lemon-caper vinaigrette and Chicken of the Sea Lemon Flavored Salmon. When my energy is low and time is short, these salmon pouches come in extra handy for a quick lunch. I’ve been known to grab a fork and eat the salmon straight from the pouch! These salad cups are loaded up with summer. 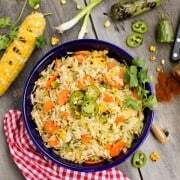 Fresh sweet corn kernels, cut raw from the cob are one of my very favorite summer salad toppers, lending sweet little pops of flavor in every bite. I also added fresh snap peas and golden cherry tomatoes, precious fresh pickings that we grow in our own garden each summer. 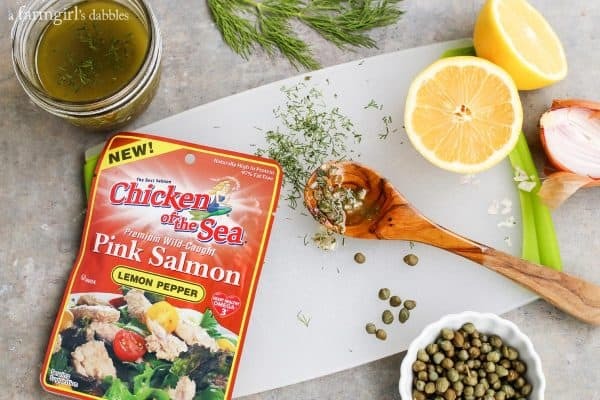 The lemon-caper vinaigrette is bright and beautiful, and brings out even more of that lemon flavor in the salmon. A little drizzle over the top of the salad cups brings everything together for one happy plate. And if I were you, I wouldn’t hesitate to double the vinaigrette recipe. That lemony goodness begs to be drizzled over every other fresh salad and veggie that comes along! Place 1 large lettuce “cup” onto each of four salad plates. 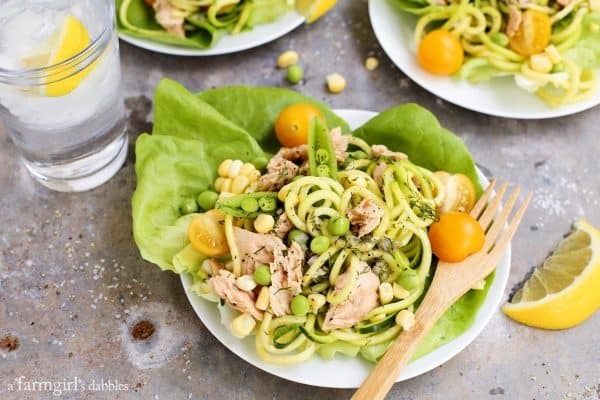 Top each piece of lettuce with spiralized zucchini. Then add corn kernels, peas, and tomatoes. Top each salad cup with one pouch of salmon. 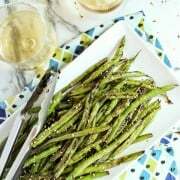 Serve with lemon-caper vinaigrette to drizzle over the top. Sprinkle salad cups with additional chopped dill, plus salt and pepper if desired. Add all vinaigrette ingredients to a small jar with a lid. Top the jar tightly with lid and then shake jar vigorously to combine. 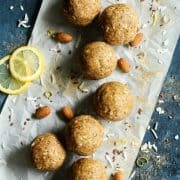 Can be made one day prior to serving. 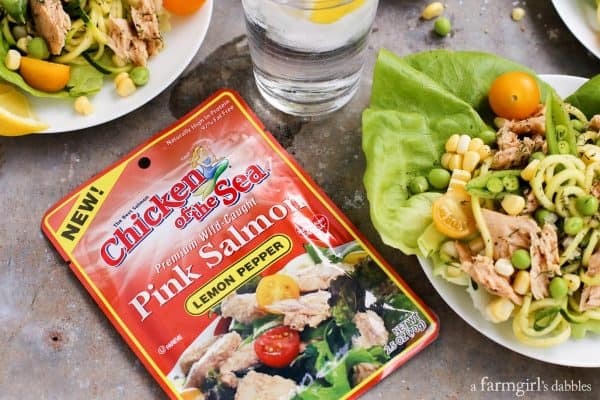 Chicken of the Sea is offering you a downloadable coupon for 1 free Flavored Salmon Pouch! To receive your coupon, simply click here to be taken to a VIP page where you can enter your email address and download the coupon. Please know that Chicken of the Sea will never use your email address or share it with any third parties. This post is sponsored by Chicken of the Sea. I am happy to be partnering with them this year, bringing you delicious recipes from the sea. All opinions are 100% my own. Thank you for supporting the brands that help make this site possible. Yuuuuummmm! I love how healthy and packed full of flavour this salad is. Definitely making this soon. So many pretty colors and textures here! I’m sure that vinaigrette is the perfect pairing for the salmon. Must . Get. 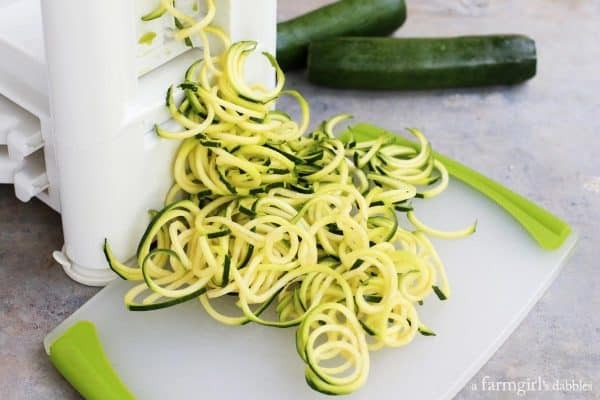 Spiralizer!!! Looks amazing Brenda! What a beautiful spring salad! Love the fresh dill! I have some of this yummy Chicken of the Sea salmon in my pantry! 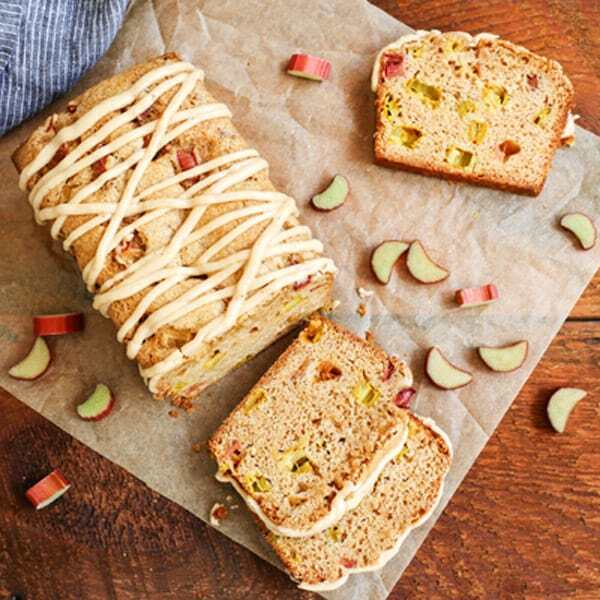 What a fabulous recipe—perfect for my lunches this week! With the current heatwave we are experiencing these cups look so refreshing! Can’t wait to try! 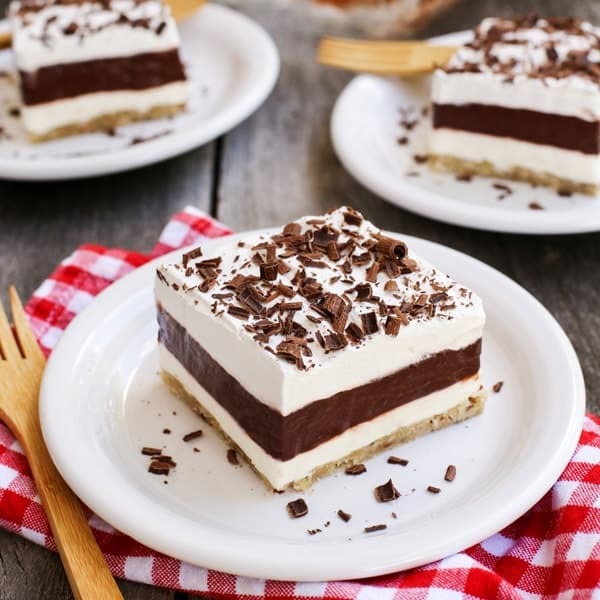 Perfect for hot summer days! Thanks, Lauren.